This article is about Ridley's appearance in Super Smash Bros. Ultimate. For the character in other contexts, see Ridley. Ridley (リドリー, Ridley) is a playable character in Super Smash Bros. Ultimate. He was revealed as a newcomer alongside Inkling and Daisy from Nintendo's 2018 E3 press conference, on June 12th, 2018, with an animated trailer. Ridley is classified as fighter #65. Similar to Bowser and Donkey Kong, Ridley has no voice actor and instead roars and screeches, similarly to his sounds in Super Smash Bros. Brawl, Super Smash Bros. for Wii U, and various Metroid games. 6 Classic Mode: It Can't Be! Space Pirates! Play VS. matches; Ridley is the 25th character unlocked. Clear Classic Mode with Yoshi or anyone in his unlock tree; Ridley is the 6th character unlocked after Lucina. Have Ridley join the player's party in World of Light: defeat the Creature and Fleaman spirit in Dracula's Castle inside the World of Dark. Except for the third method, Ridley must then be defeated on Norfair. Ridley, unsurprisingly for being a large character with powerful attacks, is a heavyweight character, although he weighs much less than a super heavyweight despite his similar size. However, his attributes compared to other archetypical heavyweights are noticeably different, with overall excellent mobility in the 10th fastest dashing speed, average air speed, 16th fastest falling speed, average gravity, and an average frame data. One of Ridley's greatest strengths is his dominant air game. Boasting overall quick, powerful, and long-ranged aerials, having two midair jumps, and decent air mobility give him overall excellent air pressure potential. Thanks to his additional jump, relatively low gravity and relatively high fastfall speed, he has enormous vertical flexibility, and can use additional jumps or surprise fastfalls to fake out and punish his opponents with his far-reaching aerials. His neutral aerial, due to having low all-around lag, good range, and average knockback, is a good comboing, spacing, and edgeguarding tool, while also being fast enough to break out of certain combos. Forward aerial, while having merely average power, has very high damage output when all hits are sweetspotted, and is infamous for effectively performing a wall of pain at low percentages, especially due to Ridley's aforementioned two midair jumps. Back aerial is quick, long-ranged and has very high damage and knockback, which makes it a deadly edgeguarding tool and can KO especially early offstage. Up aerial is a good juggling move with quick startup and good KO potential when sweetspotted, but it has moderately linear hitboxes. Lastly, down aerial is a stall-and-fall that powerfully meteor smashes opponents when sweetspotted, and can potentially be recovered from if initiated slightly above the ground. Even when sourspotted, it has high KO potential. Overall, Ridley has many options to rack up damage in the air, and has easy ways to set up into them. Ridley also has an abundance of powerful moves like his fellow heavyweights, which leads into one of his other primary strengths; his edgeguarding ability. His aforementioned potential in the air gives him terrifying offstage presence, and many of his attacks have great KO potential. His aforementioned forward aerial boasts great wall of pain potential with enough reach and a long enough duration to effectively gimp most recovering opponents. Ridley also has easy ways to set up edgeguards; his down tilt and down throw are both very reliable combo starters that launch at favorable angles, and he has plenty of other attacks that have high horizontal knockback, such as forward tilt and dash attack. Overall, Ridley poses a huge threat when his opponent is offstage, as making the right plays will give the opponent little to no chance to come back. Another noteworthy aspect of Ridley are his smash attacks, which all have their exclusive advantages. Forward smash has slow startup and short range, though is one of the strongest of its kind in both damage and knockback, and is just fast enough to punish whiffs or be a situational follow-up option, like being a follow-up to a late hit of a landing neutral aerial. Down smash has noticeable start up and less extreme raw power, but has extreme range and is one of his few moves to make use of the invulnerable parts of Ridley's wings. Down smash also has a unique attribute in that Ridley hops very high during the start up, which can completely dodge attacks with low aim and sometimes those with center aim, making it especially effective in fields like punishing a get up attack or punishing grab whiffs. It is also a notoriously effective punishment option after a successful Skewer sweetspot, as the short hop itself can cover most get-up options. Finally, Ridley's up smash is his fastest smash attack and, while not having the sheer power of the other two, is his least situational as it can be a very effective anti-air and can make landing a severe issue for an opponent, and still boasts above average raw power. Overall, each of Ridley's smash attacks boasts the typical great power of a heavyweight, but all come with different attributes to make each one useful in the field. Lastly, his special moveset offers interesting options. Plasma Breath is a chargeable projectile move, and when fully charged, it deals substantial damage and can hit multiple times. These traits make it a useful edgeguarding, damage-racking, and gimping tool. The recoil of Plasma Breath can even serve as a niche defensive option due to Ridley not suffering any knockback from it, especially when offstage. Space Pirate Rush is a command grab with some unique perks; it can be cancelled into a throw at any time that puts both Ridley and the opponent into the air. This allows for easy gimps offstage as Ridley can drag opponents closer to a blast zone, potentially leaving them too far to recover. Onstage, when performed from one ledge to another, deals substantial damage and launches opponents offstage when Ridley reaches the edge of a floor, with the launch being capable of KOing at high percentages. Wing Blitz is Ridley's primary recovery move that can be aimed in four directions, and has impressive offensive potential. The up, forward, and back inputs all have high KO potential, and the down input meteor smashes opponents, with all variants having the ability to snap the ledge during the move, making it a deadly edgeguarding move. Lastly, Skewer is a "high risk, high reward" and punishment move that, when sweetspotted, deals extremely high damage and crumples enemies, where Ridley can then read an opponent's reaction to put them in a dangerous position. While Ridley has amazing strengths, he also has some weaknesses. Ridley has the largest hurtbox out of all characters, combined with his heavy weight and fast falling speed makes him very easy to combo, juggle, and hit in general, and while Ridley's frame data is decent, especially for a heavyweight, he is nevertheless rather easy to punish due to some of his best attacks having noticeable ending lag. His options against projectile users and zoning is rather poor, despite having a projectile himself; Plasma Breath is laggy and its projectiles travel slowly, while the move also possesses a hurtbox on Ridley's mouth that damages and stuns him if he is hit there, and even if said recoil prevents knockback, it can easily open up opportunities for more attacks against him that would end a stock. This trick also has virtually no beneficial use outside surprising unfamiliar opponents or emergency situations during kill percent. Overall, Ridley's vulnerabilities give him difficulty against characters with better frame data and edge-guarding/pressuring tools. Another weakness, while not as significant as his susceptibility to combos and projectile pressure, is his laggy and predictable recovery; despite Ridley having average air speed, two midair jumps, and two useful recovery options being Space Pirate Rush and Wing Blitz, these can be easily intercepted by keeping Ridley offstage. Both of his recovery specials also have high startup and Wing Blitz, despite its impressive distance, has only four angled travel routes, which means that Ridley has to properly get into a good position to recover, which gives the opponent more than enough time to react. While Wing Blitz has some minor defenses while active, that being invulnerability around the spiked tips of his wings along with dealing heavy knockback and damage with contact, his actual, vulnerable body can be quite easy to aim for. This is doubly worse when a character has disjointed attacks, as they can safely challenge the move at any state of it's animation and so much as scraping Ridley himself would beat it. Lastly, Ridley's overall endurance and survivability, despite being a heavyweight, is rather below-average for said weight category. While he is considered a heavyweight fighter, he is somewhat notorious for being KO'd rather easily despite this. When combining his previous flaw of being unable to escape combos effectively, he is one of the most affected characters by large combo strings, and is rather easy to finish off. As a result, while his survivability isn't as poor as other lighter characters, it is unimpressive for a heavyweight of his size. Overall, Ridley has excellent pressuring and edge-guarding potential with an arsenal of powerful moves and tools to gain advantage, but has to rely on reads, quick reflexes, and baits to take full advantage of his humongous power output, and prevent the opponent from capitalizing on his susceptibilities to combos, zoning and being edge guarded. Ridley's toolkit being heavily lopsided towards raw damage and killing means that Ridley can easily make comebacks or greatly widen his lead with minimal set up should an opponent budge an inch or make a single error in considering Ridley's approach. However, his lack of defensive options and vulnerability means that one wrong move from Ridley himself can devastate him worse than almost every other character. If Ridley plays recklessly or even predictably, he will be punished easily with a slew of combos, face walls of projectiles, and general pressure he isn't built to handle. Ridley's competitive potential is subject for debate. Many professional players like ZeRo are considering him a low tier character that is worse than the majority of the roster for his susceptibility to combos, supposedly limited development, and general difficulties in survival. Others like Leffen, Dabuz, and ESAM argue, however, that he's surprisingly impressive in high level play thanks to the sheer effectiveness of his pressuring and edge-guarding tools along with his relatively high DPS that complements his many kill moves. This can be further expressed by his tournament presence, where Ridley is a relatively unpopular pick, yet displays very respectable results wherever he does show, with Trela's Ridley even winning gold at multiple tournaments and Tweek's Ridley finding similar success. Because of this, Ridley is generally considered viable, but to whether or not this is due to unfamiliarity in an undeveloped meta or if Ridley has genuine promise is unknown. Plasma Breath deals less shield damage. A successful Plasma Scream has less ending lag, allowing Ridley to act before opponents can. Ridley can perform two midair jumps. 2% A double claw swipe followed by a bite. Alternatively, if the attack button is pressed quickly for each hit, the second hit transitions into a rapid-fire tail stab that ends with a swing. The third hit is relatively strong for a neutral attack, KOing middleweights under 200% from the center of Final Destination. Conversely, the neutral infinite's finisher has high base knockback, but very low knockback scaling, being unable to KO under 500% from center stage. 10% (tail), 13% (tip) Grabs his tail and thrusts it forward. Can be angled, and the tip of Ridley's tail acts as a sweetspot. Has long range and moderately low ending lag, making it a powerful spacing tool. The sweetspot KOs at around 155% from center stage. 7% (wing), 9% (tip) Swipes one wing in an arc above himself, starting from behind. Renders Ridley's wing intangible while the hitboxes are active, which along with its coverage allows it to function as an effective anti-air. Its moderate speed also allows it to combo into itself at low to mid percents, and into any aerial attack at mid to high percents. Has blind spots beside Ridley. 6% (tail), 9% (tip) A low tail swipe. Has long range like his forward tilt, and launches opponents upward, allowing it to combo into aerial attacks at a wide range of percents, as well as an up-angled forward tilt, dash attack, or up tilt (against larger characters) at low percents. 12% A leaning bite. A powerful dash attack especially near edges, KOing at around 100% at the edge of Final Destination, and at around 160% from the center. 20% Rears back, then generates a fiery explosion from his mouth in front of himself. Has slow startup and short range (covering less horizontal distance than his forward tilt), but deals very high damage and knockback, KOing under 80% from center stage. 17% A frontflip kick, covering Ridley's entire overhead. Has moderate startup and ending lag, but has a large overall hitbox and grants intangibility on Ridley's leg while the hitboxes are active, making it a powerful anti-air similarly to his up tilt. Can KO at around 105% from ground level. 16% Leaps and slams his open wings onto the ground. Hits both of Ridley's sides simultaneously with large coverage, and the leap during startup can allow him to dodge some ground attacks if timed right (especially floor attacks that may be used after hitting with Skewer, or ledge attacks), while the edges of the attack utilize the intangible half of Ridley's wings. However, it has the slowest startup out of Ridley's smash attacks, and deals the least damage, while being only slightly stronger than his up smash. Launches opponents upward, KOing at around 100%. 9% (clean, tail), 12% (clean, tip), 5% (late) Backflips and swings his tail around himself, similar to Charizard's neutral aerial except backwards instead of forwards. Has the lowest startup, ending lag and landing lag out of Ridley's aerials, as well as a long duration and a large hitbox, making it one of his main approach options. Upon landing, it can also combo into a jab, forward tilt, down tilt or grab at low percents, and another neutral aerial or a forward aerial at mid percents, especially if the sourspot is landed. 3% (hits 1-2, tail), 5% (hits 1-2, tip; hit 3, tail), 7% (hit 3, tip) Stabs with his tail forward three times in quick succession. Deals the most damage out of Ridley's aerials if all hits are sweetspotted (17% total); however, it is also his weakest aerial knockback-wise, while its hitboxes are small compared to his other moves. Has moderate landing lag, albeit the first hit can set up a jab. 15% A roundhouse kick behind himself, similar to his archnemesis Samus's back aerial. Ridley's strongest aerial, KOing at around 130% from center stage. Its horizontal range and high damage also make it a relatively safe approach option, despite its moderate landing lag. 12% (wings), 14% (tip) Thrusts both wings upward while closed. Has a sweetspot at the tip of the wings, which can KO at around 120% in the air. Its moderate startup and landing lag alongside Ridley's speed make it effective for juggling. On landing, it can also combo into an up tilt or up smash at low percents, as well as any aerial (except down aerial) up to high percents, including a sweetspotted up aerial as a potential KO setup. 14% (clean, feet), 12% (clean, legs; late) Plummets down stomping with both feet. A stall-then-fall with a sweetspot on its clean hit that meteor smashes opponents. Unlike most other moves of its kind, Ridley can also recover from it offstage if initiated at least at some height above the stage. However, it has very high landing lag, leaving it unsafe as a landing option and preventing any followups out of its meteor smash onstage. It resembles a move Meta Ridley uses in Metroid Prime. — Reaches out with his right hand. 1.6% Thrusts his tail into the opponent. 9% Tosses the opponent forward with one arm. 11% Turns around and performs an underhanded toss with one arm. Can KO at around 150% near the ledge. 8% (hit 1), 4% (throw) Sets the opponent overhead and stabs them with his tail. Ridley's most damaging throw. Can combo into an up aerial at mid percents if the opponent does not air dodge, and otherwise lead into a frame trap by landing and punishing their air dodge landing lag. 7% Slams the opponent onto the ground. Has low ending lag, allowing it to combo into an up-angled forward tilt or down tilt at low percents, and a neutral, forward, back aerial or run-canceled up tilt at low to mid percents. Surprisingly, this is also Ridley's strongest throw, being able to KO at around 160%. 7% Performs a claw swipe around himself while getting up, starting from the front. 7% Swings his tail forward, then backward while getting up. 5% Swipes an arm backward, then kicks forward. 10% Climbs up and performs a claw swipe. Plasma Breath 4.5%-5.66% (clean), 3.5%-4.4% (late) Spits a fireball from his mouth forward, which bounces along the ground. It can be charged to have Ridley spit up to a maximum of five fireballs, which also increase in size and damage, dealing up to 28.3% if all of them connect. When charged, it is fairly effective for camping and edgeguarding due to its low ending lag and sheer amount of projectiles, and can rack up damage quickly if uninterrupted. However, it has rather high startup, and hitting Ridley's mouth while he is charging the move causes recoil damage to him depending on how much it had been charged. The recoil animation lasts 56 Frames. Space Pirate Rush 4% (slam), 2% (drag loop), 7% (throw) Rushes forward to grab an opponent, functioning as a command grab. If successful, Ridley slams them onto the ground and drags them forward along it, dealing continuous damage, then throws them either upon reaching an edge or if the special move button is held. The move deals more damage the more distance the opponent is dragged along the ground, dealing 17% minimum when throwing manually, and can rack up a lot of damage in a short span of time. However, they can mash out of the move before Ridley throws them, with how fast they can escape depending on the difference between their percent and Ridley's. In midair, it doesn't incur helplessness, allowing it to extend Ridley's recovery, and grabbing an opponent causes him to fall down with them until landing or throwing them manually, allowing it to be used for a sacrificial KO. However, it has some startup lag, and the aerial version causes Ridley to drop downwards after its horizontal momentum ends, making it possible to mistime a recovery. Wing Blitz 18% (up), 16% (forward/back), 15% (down), 5% (down, landing) Charges up, then performs a flying tackle in any of four possible directions: straight up by default; forward and slightly down; backward and slightly up; and down and slightly forward. The move travels a long distance, does not lose power while traveling and is noticeably powerful, with the forward and up tackles KOing under 130% from center stage. The down tackle also meteor smashes aerial targets, while allowing Ridley to save himself by grabbing an edge, making it potentially deadly for edgeguarding. However, the move has very slow startup, and its few angles limit the positions from which Ridley can safely recover with it. Skewer 5% (tail), 40% (tip, hit 1), 10% (tip, hit 2) Brings his tail back as it glows briefly, then stabs forward with it. If hit near the tip of the tail, it deals extremely high damage (50% total) and causes opponents to crumple, akin to a fully charged Focus Attack; both the sweetspot and the sourspot deal minimal shield damage, however. It has a very slow startup of half a second (30 frames), and conversely deals low damage and knockback if any other part of Ridley's tail hits, making it significantly hard to land especially in one-on-one battles. Additionally, the sweetspotted attack only allows Ridley to move after the opponent gets up again, making followup attacks based on reading the opponent's getup option. Plasma Scream 15% (dash), 40% (cutscene), 15% (release) Lets out a roar and dashes forward. Upon hitting an opponent, a cinematic sequence begins with Ridley headbutting them onto Samus's gunship; as the gunship flies off, he shoots it down with a laser that engulfs both the ship and the target in an explosion. After the cutscene ends, the opponent is meteor smashed and the gunship can be seen crashing in the background of the stage. This Final Smash is an instant KO on opponents at 100% damage or higher before the cutscene ends. Swoops down at an angle, before landing and letting out a roar. Up taunt: Roars and strikes a menacing pose, flapping his wings rapidly. Side taunt: Spins in a circle, finishing in a celebrating pose. Down taunt: Straightens up his body as if noticing something, before easing up while slightly smiling. His body lets out a noticeable crackle as he stands upright. Spreads his wings out and shakes his body a little. Caresses his chin with his claw and licks the edge of his mouth while audibly snarling. Flies into the scene, lands, and drifts to a stop. Somersaults and screeches, then lands with a slash. Claws at the ground repeatedly and bites once afterwards. He then turns toward the camera as he grins. The way the camera is angled makes it appear as if Ridley is supposedly ravaging a downed opponent, but it was revealed in Team Battle clearly shows that he is scratching at the bare ground. Iota - Placed 2nd at Just Roll With It! 10 and has taken a set off of Mekos. Kvothe - Placed 9th at Don't Park on the Grass 2018. Locus - Placed 13th at Don't Park on the Grass 2018. Trela - Placed 1st at Ultimate Shockwave 2, Ultimate Shockwave 14 and TGC Returns. Tweek - Placed 5th at Collision 2019 using mostly Ridley. Venom - Placed 2nd at LAN ETS 2019 while defeating SuperGirlKels, Darkwolf and Fwed. Vreyvus - Placed 2nd at Valhalla II. Gemini - Placed 17th at Midwest Mayhem Ultimate. Classic Mode: It Can't Be! Space Pirates! Ridley fights characters who pilot their own spaceships. Although Ridley does not appear in the World of Light opening cutscene, he was vaporized and later imprisoned alongside the rest of the fighters (sans Kirby) when Galeem unleashed his beams of light. 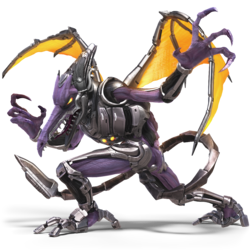 Ridley was one of the many fighters that fell under Dharkon's control upon Galeem's first defeat. He is in the Dracula's Castle sub-area, appearing on the map in the subterranean section, once the player defeats The Creature & Flea Man spirit. Ridley's Fighter Spirits can be obtained by completing Classic Mode. They are also available periodically for purchase in the shop for 500 coins. Unlocking Ridley in World of Light allows the player to preview the first spirit below in the Spirit List under the name "???". As Fighter Spirits, they cannot be used in Spirit Battles and are purely aesthetic. Each Fighter Spirit has an alternate version that replaces them with their artwork in Ultimate. Additionally, other forms of Ridley make an appearance in a few Primary and Support Spirits. Ridley had two palettes in demo versions of Ultimate that are not available in the final game: a dark, charcoal colored one with orange wings, and a light gray one with green wings, claws, teeth and protrusions. Each corresponds with the colors of Meta Ridley and Mecha Ridley, respectively. Using Plasma Breath on Mario Galaxy. Using Wing Blitz on Midgar. Using a Hammer on Wrecking Crew. Using Skewer against Fox on Battlefield. In his Meta Ridley costume with Samus on Castle Siege. Ridley attempting to burn Marth with his neutral special on 3D Land. Ridley about to be hit by Zero's Genmu Zero on Midgar. Ridley, Jigglypuff, Ice Climbers, and Zelda on Summit. With Kirby, Mario, Link, Inkling, Marth, Pit and Villager on Battlefield. Using Space Pirate Rush on Sonic on Castle Siege. Ridley Hits the Big Time. Ridley’s model appears to be based on his Super Metroid sprite with additional details and embellishments, some of which loosely resemble his design in Metroid: Other M. His size is significantly reduced to that of his appearance in the NES Game Metroid, where his hunched posture is only slightly taller than Samus. Sakurai was reported to have heavily based Ridley on his depiction in the original Metroid, specifically how the sprite appeared hunched over even while flying. Previously, Sakurai did not want to include Ridley in Super Smash Bros. as a playable fighter due to various reasons, including believing that reducing his power to playable levels will undermine his presentation and, more infamously, his size being too big to properly integrate into the universe, the latter to the point that it has widely been considered an internet meme. In fact, as of the current version of the game, Ridley has the largest character model of all playable characters, with even his hunched over posture being taller than the likes of Bowser and Donkey Kong, his head alone being taller than Mario, and his total wingspan being far longer than most character's entire height. This is most noticeable during his down taunt, where his straightened back demonstrates how much taller he is than other characters. His fighter tagline, "Ridley Hits the Big Time! ", likely references the size debacle. According to Sakurai from a Nintendo Dream Magazine interview, Ridley was added in due to the Smash Bros Fighter Ballot. Ridley's pose in his official artwork resembles the pose Bowser makes in his official art for SSB4, only mirrored. His animated reveal trailer is the first time since Ridley's role in the Metroid manga where Ridley has displayed a sense of humor, playfully twirling the hat of a defeated Mario when revealing himself to Samus while flashing an inhuman grin. The way Ridley twirls Mario's hat bears a striking resemblance to Mario in the beginning of the reveal trailer of Super Mario Odyssey. The part where a Metroid attacks Ridley before a stunned Pikachu is likely a reference to the ending of Super Metroid when the Baby Metroid protects Samus from Mother Brain. It also resembles a pivotal point in his boss fight in Metroid: Samus Returns, where the Baby Metroid saves Samus from Ridley by leeching some of his energy. The fact that it is Pikachu might also be a call back to their previous encounter during the Subspace Emissary. Coincidentally, both Pikachu and the baby Metroid save Samus in a similar manner in their respective games, with Ridley in both instances briefly clutching his head and then roaring with rage. Interestingly, Pikachu also appears on Pyrosphere in the 2014 Smash Bros. Direct when Ridley's appearance as a boss character on that stage was first teased. The moment Ridley appears in his introductory trailer resembles his appearance in Metroid: Zero Mission, just before his fight. This includes the way Samus looks at the screen, Ridley's entrance animation, and music timing. 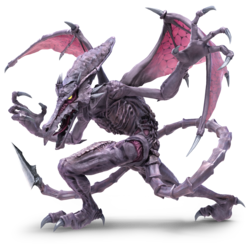 Ridley is the second Smash Bros. boss character to become playable in the series after Giga Bowser and the only boss character to be playable at all times, as Giga Bowser is limited to Bowser's Final Smash. There is an error on Ridley's page on the Latin American and Canadian French version of the Smash Bros. website. The reveal trailer videos are unavailable, with the Latin American version mistakenly linking to a Japanese Mario Tennis Aces video. That's not a variation of Samus Aran, and therefore does not have "Samus" in his name. Who is male rather than female. Who cannot wall jump and lacks a tether. Masahiro Sakurai has stated in an interview that Ridley's down taunt is among his favorite taunts in the game. Ridley is one of two newcomers (the other being Inkling) to be in a veteran's gallery on the official website, specifically Marth's. Ridley has the fastest running speed out of all the newcomers, running at the same speed as Charizard. Ridley is unlocked through Yoshi's unlock column, referencing the fact that both characters are reptiles and have the ability to breath fire. Ridley also appears as an opponent in Yoshi's Classic Mode, Jurassic Journey!. Yoshi's unlock column also features Marth, Lucina and Chrom, all of which have faced a giant malevolent dragon (much like Ridley) as their arch-enemy. Ridley is also fought in Marth's Classic Mode route, A Kingdom of Dragons. 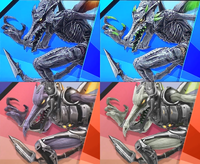 Ridley is the only character in Ultimate to not recieve a significant eye color change after obtaining a Smash Ball or during a perfect shield animation due to his eyes already being yellow. Meta Knight's default eye color is also yellow, though his eyes do change into a crimson color in these circumstances. When zooming in behind Meta Ridley's wings, his right wing does not fully connect to his back. This page was last edited on April 19, 2019, at 17:55.